One of the basic rules of composition is the rule of thirds. This is a very basic rule, that is often ignored by amateurs, and can drastically improve your pictures. Here is how this rule works: imagine that you draw lines across your frame to form a tick-tack-toe playing board. (you should end up with nine identical squares). Now the image is divided to thirds, both horizontally and vertically. See the diagram for lines positions. 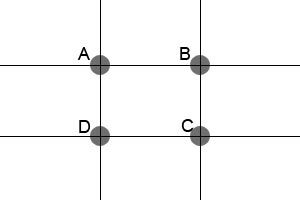 The Idea is to place important elements in the pictures where the lines intersect (the gray circles). Those intersections are also called golden sections, and the rule is also called The Golden Ratio Rule. Lets look at this portrait. see how the girls face is at the top left intersection? (move the mouse over the image to see the golden section). The practice with the “thirds ” rule is to place the eyes on the top line. The rule of thirds also works for landscape pictures. 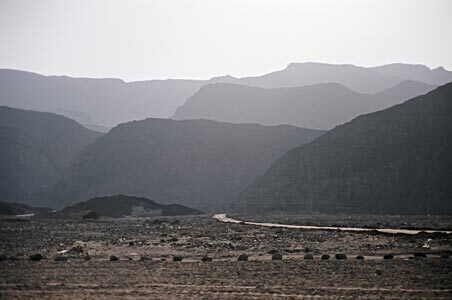 In this picture, taken in Sinai, the land covers the lower third, while the sky (and mountains tips) cover the upper third. Move your mouse over the picture to reveal the thirds. This rule is very effective when shooting sunsets (see the sunset photography guide). To work with this rule, you should place the horizon on the lower third line, and place the sun on one of the vertical lines. Allot of times, you will find it easy to focus first, then compose. If you are using an old camera, that has only one focus point, at the middle of the frame, you can use the following method). place your subject in the middle of the frame, lightly press the shutter button to focus, then, without moving your finger, re-compose and complete the press. Another interesting point is the relations between the sections. which section is the one that get most of the attention. since we usually scan from top to bottom, the two upper section points A and B are the ones we scan first. the order between them depends on the viewer language. English readers, for example, will scan point A first, since they read from left to right. Hebrew or Arabic speakers will scan point be first. So if you know who your viewers will be, and you can control composition to a great extent, make sure that your object is placed at the right side.